You could call it the Cinderella of bridges. For over seventy-five years, the San Francisco-Oakland Bay Bridge has served as one of the hardest-working bridges in the U.S. Yet it remained overshadowed by its famous golden sister to the west. In 2013, the Bay Bridge finally emerged onto the world stage, resplendent in light and transformed by artistic ingenuity. The Bay Lights project, an innovative public artwork, illuminated over 25,000 LEDs strung along the bridge’s suspension cables. 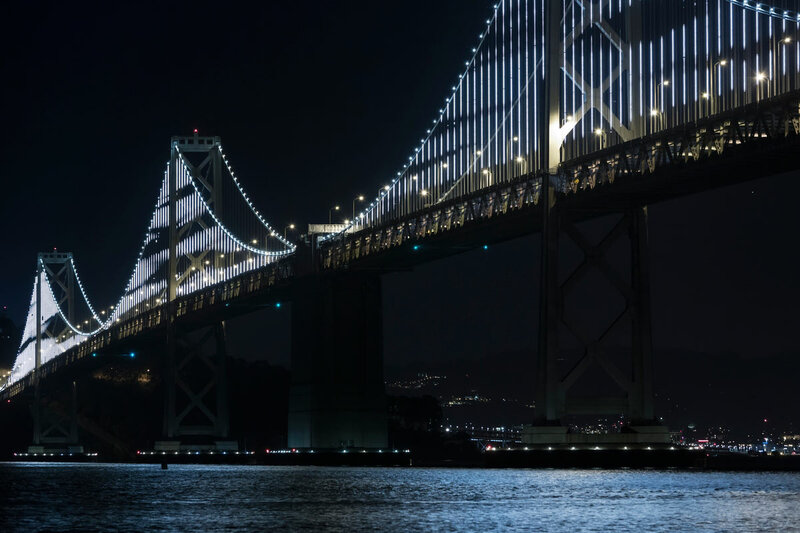 Each night, the artwork randomly generated light patterns that animated the grey canvas of the bridge and delighted Bay Area residents and visitors. The Bay Bridge had finally become glamorous. Treating the Bay Bridge as a canvas of light was the brainchild of Ben Davis, who reached out to the acclaimed light artist Leo Villareal. Through the support of public agencies, private donors, and citizen engagement, the artist’s vision was installed from 2013-2015. Ben Davis established ILLUMINATE, a nonprofit arts organization, to oversee the artwork’s permitting, installation, fundraising, and operations. Now, the Bay Bridge is ready for its encore. On January 30, 2016, a more robust, long-term installation of the Bay Lights will debut—just in time for San Francisco’s latest gala event, Super Bowl 50. To Bay Area residents, The Bay Lights offer a way to connect more deeply to their community. To the team at ILLUMINATE, The Bay Lights represent a beacon of possibility, inspiring other amazing large-scale artworks that could transform city spaces and public consciousness. To further this vision, ILLUMINATE wanted to build a conceptual bridge—helping people connect The Bay Lights to the possibility of future public art. Their Shine It Forward program invites people to dedicate one of the artwork’s LEDs to a loved one. By doing so, they not only further personalize their own experience of The Bay Lights, but they also help bring more monumental art to their community. One of ILLUMINATE’s corporate supporters is Salesforce. Through the Salesforce Foundation, the organization was able to use the Salesforce Platform to establish a donor system of record. 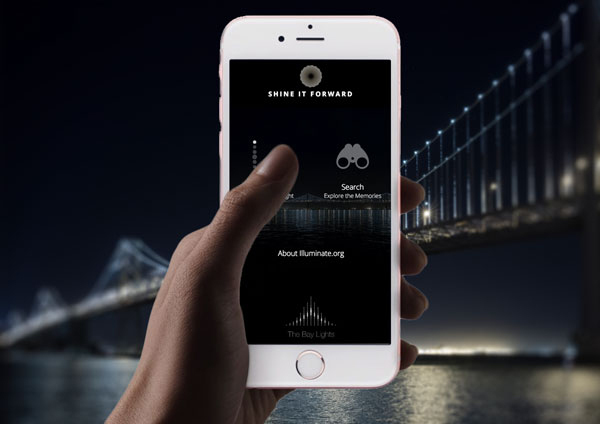 Heroku contributed platform resources and developers to create a donor engagement app running on Heroku to support the Shine It Forward program. The app was primarily created by one developer with occasional input from others on specific features. The app’s data model was designed to operate directly against ILLUMINATE’s Salesforce objects via Heroku Connect. All website data, such as donations, personalization, and The Bay Lights interaction, is immediately reflected in ILLUMINATE’s existing Salesforce org as opportunities, contacts, and custom objects. This gives the organization a current view of all donor information integrated with their existing operational data. The strategic use of Heroku Add-ons to develop certain features allowed the app’s developer to stay on track to deliver within a six-week timeframe. Using Filestack, a filepicker widget was embedded that provides an entire file infrastructure, enabling users to upload photos to the app from social media, cloud drives, and other file services. It also provides a cropping interface and multiple resolutions for output in different layouts, as well as pushes to Amazon S3 file storage. The app also provides a downloadable "certificate of authenticity"—a beautifully designed photo of The Bay Lights with personalized text overlaid. This was implemented using another image processing add-on called Blitline. It took a bit more configuration than Filestack, but it bypassed the need to create a custom buildpack for image processing, which reduced development time by a week. Other key Heroku Add-ons included: a Heroku Postgres database, Mailgun for email automation of personalized thank you emails and Papertrail for log management. Shine It Forward is comprised of two apps—the donor-facing UI and the API—with a microservices architecture. The organization’s home site, Illuminate.org, was also ported to Heroku so it could be managed alongside the others. Each of the three apps is set up with their own Heroku Pipeline. The backend API is written in Ruby using Pliny, Heroku’s defacto Ruby API library. It’s a JSON REST web service and handles the data and service integration with most of the add-ons and Heroku Connect. As far as workflow, the developer used Salesforce Sandbox and Change Sets to deploy changes on the Salesforce side, and Heroku Pipelines to deploy Heroku app changes. To minimize friction for donors, ILLUMINATE wanted a mobile-first, responsive web app that would perform gracefully across mobile, tablet, and desktop browsers. 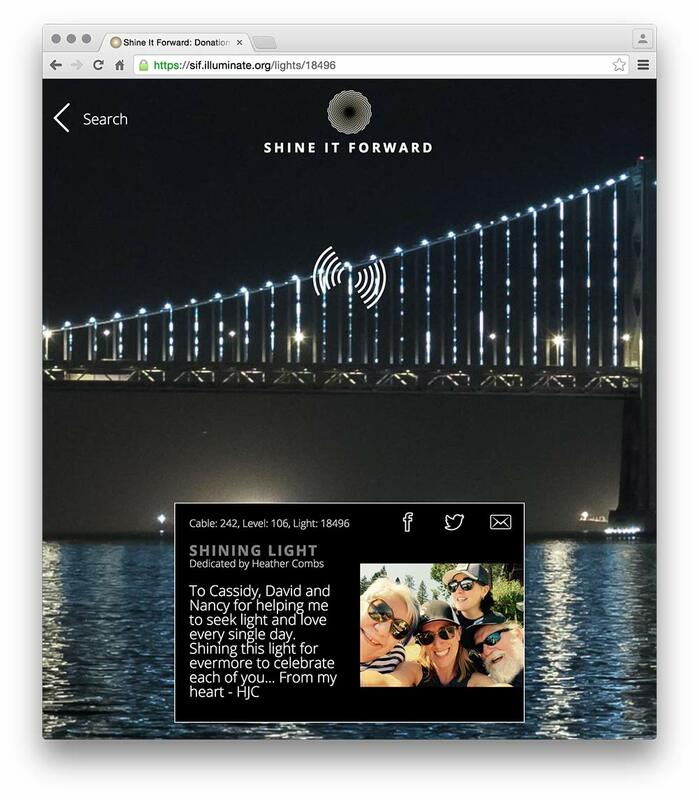 Using the Shine It Forward app, a donor can dedicate a light in The Bay Lights project to a loved one and memorialize the dedication by uploading a photo and text. The system randomly assigns a light from the available pool, and users can navigate to the light detail page and zoom in on their specific light. A permalink is generated for users to share their dedication on Facebook, Twitter, or other social media sites. For ILLUMINATE, artistic and technology innovation are the perfect match. Together, they can help inspire generosity, create meaningful art, and build a stronger, engaged community. You too can Shine It Forward and support more public artwork like The Bay Lights! Are you building a comprehensive donor engagement system? Heroku and Salesforce App Cloud has helped ILLUMINATE set up their nonprofit organization for a long-term future. For more information, contact Heroku today. ILLUMINATE is a nonprofit arts organization based in San Francisco, Ca. Their mission is to produce contemporary art with civic impact, social activation, and global reach in order to stimulate a culture of generosity and collaboration. ILLUMINATE’s flagship project is The Bay Lights, one of the largest pieces of public art in history. Conceived and permitted as a two-year installation, the original artwork shone nightly from the San Francisco-Oakland Bay Bridge between March 5, 2013 and March 5, 2015. The artwork will be re-lit on January 30, 2016 and gifted to the State of California for ongoing stewardship. For more information, visit: illuminate.org and sif.illuminate.org.